Screen shot of IDD website. 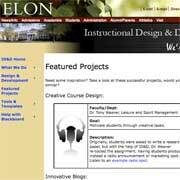 The first major project I was involved with at Elon, was to recreate their website. The goal was mainly to make it conform with all other departments on campus. Elon has since completed a major revision to the site, to which I did not contribute. Created this webquest as an assignment for UMass’s Designing Web-Based Training course. Designed and built this website for a friend trying to start her own business. This site was an idea for a capstone project. It was an attempt to make a portal site for instructional designers. Although it scored great with my classmates and professors, it never got off the ground. A school project to redesign a website. Compare my version with their version. Two concepts for an artist’s showcase: Concept 1 and Concept 2.